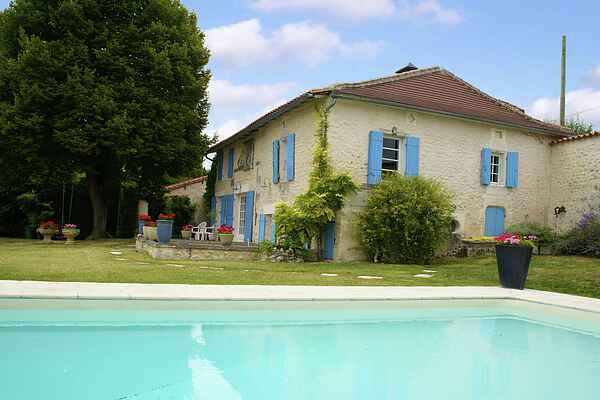 In this particular holiday villa in Lusignac (2 km) you can celebrate the holidays like a god in France. With complete privacy, on a huge estate and with a swimming pool (with wild water slide) you'll amuse yourself tremendously. Directly from home you'll walk through the fields full of corn and sunflowers, forests and idyllic villages; Vincent van Gogh did not set his easel in your \"front yard\" for nothing. The house consists of a main building and a guest house. There are Dutch books present. You can also go swimming in the Dronne River at Aubeterre-sur-Dronne (16 km, with a beach) and canoeing in Ribérac (13 km), located along the same river. In this little town you'll encouter many lovely shops, restaurants and terraces. Furthermore, here you will especially enjoy the tranquility and beautiful scenery. By car it's easy to find some more hustle and bustle. Visit the picturesque Brantôme (37 km) and the capital of the Périgord, Périgueux (48 km). Here you'll find a beautiful cathedral and a beautiful historic city center. In Le Grand Etang de la Jemaye (27 km) you will find many facilities for a sporty and relaxing day out.